34 acres in growing residential area. Pad sites available with excellent retail locations. 2 miles from I-45 North in Spring, 9.5 miles from Beltway 8 and 10 miles from Houston Intercontinental Airport. This is an excellent opportunity to develop a neighborhood retail center as the surrounding community is growing quickly and this parcel is easily accessible. Tract 1 – 4.78 acres at intersection of Cypresswood Dr. and Hardy Toll N and Aldine Westfield Rd. Tract 2 – 18.48 acres along Aldine Westfield Rd. 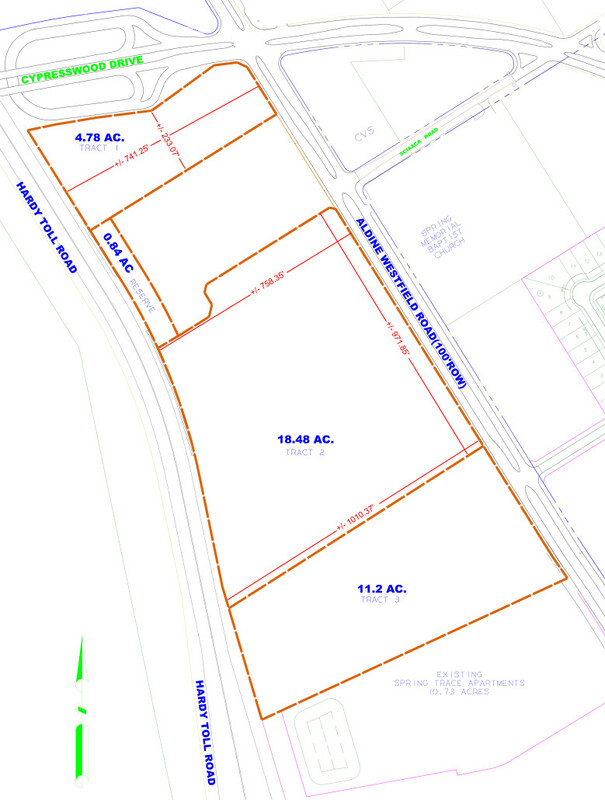 Tract 3 – 11.2 acres also along Aldine Westfield Rd.